Scooters on North Tryon Street uptown in December 2018. Charlotte City Council members approved new rules for electric scooters Monday, but only after a long debate that several members say shows a need to revisit the rules later. The new rules have been months in the making. They're the council's first attempt to address the safety of electric scooters, which have been on city streets only since May. Among other things, the ordinance caps scooter speeds at 15 miles an hour, prohibits more than one person on a scooter and bans them from sidewalks in the central part of uptown. Mayor Pro-Tem Julie Eiselt, who chairs the council's transportation committee, said Charlotte is helping to chart new ground for local regulation nationally. "We've had a lot of conversations around scooters over the past few months, a new technology that's been very disruptive but very popular," she said. 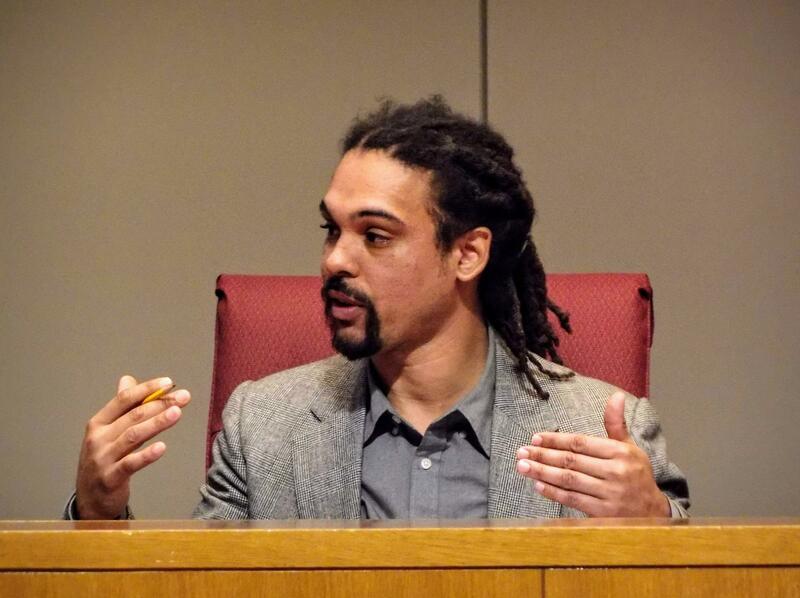 Council member Braxton Winston discussed new scooter rules at Monday's meeting. So popular that users took more than 100,000 scooter trips a month in Charlotte this fall. But safety has been an issue. Some city council members have cited scooter wrecks and injuries as an argument for safety rules. And some residents have complained about scooters taking over city sidewalks. The vote was 7-3, with council members Braxton Winston, LaWana Mayfield and Matt Newton opposed. Winston, a supporter of scooters, thinks the 15 mile an hour speed limit - alongside faster moving traffic - is too low and possibly unsafe. "This is the first round of this technology, and by putting this cap, we actually are regulating the potential of creating a safer, more durable product," Winston said. Two items discussed previously were not in the version approved last night: banning scooters from streets with speed limits over 35 miles per hour and a requirement that scooter companies put at least 20 percent of their scooters in areas described as "disadvantaged "
Three companies - Lime, Bird and Spin - now operate scooters here. Riders pay using a mobile phone app. City officials have promoted scooters as an option for what they call "the last mile" to and from public transportation. City council member Greg Phipps said before the vote he's sure the city will have to revisit the rules as the technology evolves, and if the General Assembly decides to adopt a statewide scooter law. “We are pleased with a number of provisions included in tonight’s ordinance that passed Charlotte City Council, and we are proud to provide affordable, accessible transportation to people across the city. We are continuing to review and evaluate certain provisions and will provide additional comment as we are able. Charlotte Mayor Pro-tem Julie Eiselt discusses proposed e-scooter regulations. Since last May, three companies have put about 900 electric scooters on Charlotte streets. In October 2018, users took more than 120,000 e-scooter rides. Now, city officials want to put regulations on the booming e-scooter industry. A bad wreck this week is bringing new urgency to discussions about how the city should regulate electric rental scooters, which appeared on city streets in May. Officials say there are trade-offs - between promoting a popular new transportation option and public safety. Charlotte is getting a third electric scooter company. San Francisco-based Spin says it will put 100 scooters on city streets beginning Wednesday. Statewide regulations may be coming for scooter rentals in Charlotte and other North Carolina cities. The House transportation committee chairman, Rep. John Torbett of Gaston County, told NC Insider Thursday he plans to introduce a bill that would address how the scooters should be defined under the state's traffic laws. Charlotte's electric scooter pilot program is now over, and it looks like scooters are here to stay. For now, city staff are not recommending any new local safety rules. Instead, they'll start a scooter safety campaign in the coming weeks.